xG® Technology, Inc. ("xG") (Nasdaq: XGTI, XGTIW) has announced that their IMT Vislink business is co-exhibiting with SpacePath at AfricaCom (Hall 4, Stand F21). IMT Vislink is displaying their Advent MSAT-120 satellite video and data terminal and ViewBack low latency dual channel diversity receiver-decoder, while SpacePath is exhibiting a range of high-power (HPAs) and low-power solid state power amplifiers (SSPA/SSPBs). IMT Vislink's MSAT-120 satellite video and data terminal. 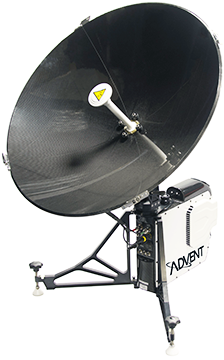 The Advent MSAT-120 is a highly portable, lightweight, tri-band satellite terminal that can be set up anywhere to provide secure and non-secure data and video transmission in as little as five minutes. The terminal supports X-, Ku- and Ka-band configurations ensuring worldwide coverage is available at all times. Available with a 65, 90 or 120 cm. reflector, the system is designed for rapid deployment in hostile environments and can be used with mains power or battery operation. Incorporated into the Advent MSAT-120 terminal, SpacePath's 60W 13.75-14.50GHz SSPA will be demonstrated at the show. Also, SpacePath will be launching a new outdoor 12W 13.75-14.50GHz Fanless SSPB. Having no fans in the construction of the product, the new fanless SSPB increases the long-term reliability of the unit and minimizes any need for regular maintenance. SpacePath's range of high-power and low-power solid state power amplifiers, which include uplink bands like C-, Ku-, DBS and Ka- will be on display as well. David Robins, Global Sales Director for IMT Vislink, noted that AfricaCom brings together around 14,000 attendees that are interested in connectivity infrastructure, disruptive technologies, digital services and ICT strategy, which makes it a great show for the company to highlight the firm's satellite products for local industry professionals. Vislink has a longstanding reputation as a global provider of satellite communications technologies and with the recent updates to the Advent line, continues to provide versatile, compact and cost-effective solutions for this market. By co-exhibiting with SpacePath, Vislink will also have the opportunity to showcase the firms' joint product offering within the Advent MSAT-120 satellite terminal.